Home » Events and Blogs » Blog » Foods that cause belly bloat! Foods that cause belly bloat! When you are bloated and have stomachaches, abdominal pain, and/or diarrhea, the insides of your intestines are irritated and, quite frankly, angry at you. Specifically, the villi, or tiny hairs that line your intestinal walls, get inflamed. Because your small intestine is about 20 feet long, and your large intestine is about 5 feet long, one microscopic inflammation can become one giant abdominal bloat. While research on this has been varied, people with stomach issues have previously been told to avoid foods with seeds, with the thinking being that these food particles could block or irritate the diverticula, or small pouches that form in the colon wall. I recommend avoiding foods like cucumbers and eggplant. 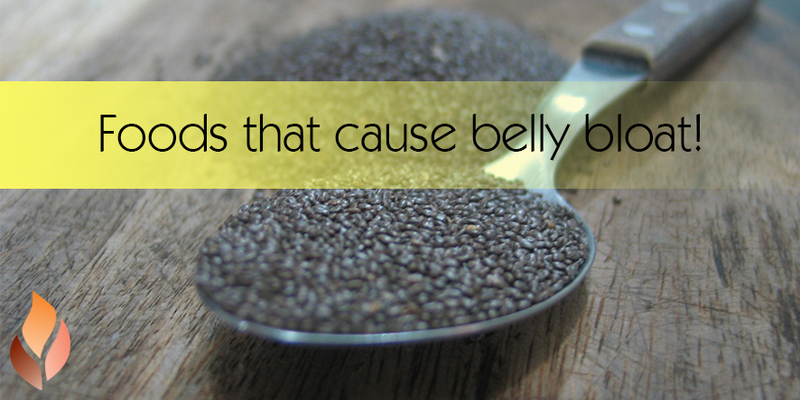 Some people report experiencing constipation and bloating after eating chia seeds — others have the complete opposite effect and find that the superfood helps to improve bowel movements. To experience the benefits of chia seeds without the negative side effects, you have to prepare the seeds properly. First, start with a small amount until your body is adjusted to eating them. When you do consume them, drink an ample amount of water; this will help to provide moisture to the seeds. Finally, you could pre-soak the seeds before you eat them; that way they’ll have enough fluid before they enter your body. Gluten is one of the major ingredients in soy sauce. If you have a gluten allergy, soy sauce (even the sodium-free kinds) will trigger inflammation across your body, especially your gut. Many people also have a slight soy allergy without realizing it. Notice if you bloat after eating tofu, soy milk, or other soy products and then remove them from your diet. Raw foods are jam-packed with nutrients, yes, but they are also incredibly hard for your digestive system to break down. Raw foods often travel through your intestines only half processed, especially if you ate while rushed or stressed, aggravating your intestines further. Here are a few other reasons to avoid raw foods. All processed foods include additives and chemicals, and many contain gluten or one of its derivatives to enhance texture, consistency, and taste. This gluten is very different from natural gluten in fresh wheat and has a direct effect on digestion. Instead of eating the foods listed above, fill your diet with cooked vegetables like spinach, carrots, potatoes, and yams. Soups, especially vegetarian ones are great for your body. I typically recommend split-pea, tomato, mixed vegetable, or bone broth soups. Teas like chamomile and mint have beneficial benefits as well!